The walkable downtown boasts green space, wide sidewalks, and bike paths. In Carmel, Indiana – a suburb of Indianapolis – getting around used to require driving. Republican Mayor Jim Brainard’s been in office since 1996. During his first campaign, he went door to door, asking people what kinds of changes they wanted for Carmel. Since becoming mayor, Brainard has overseen major development in Carmel. 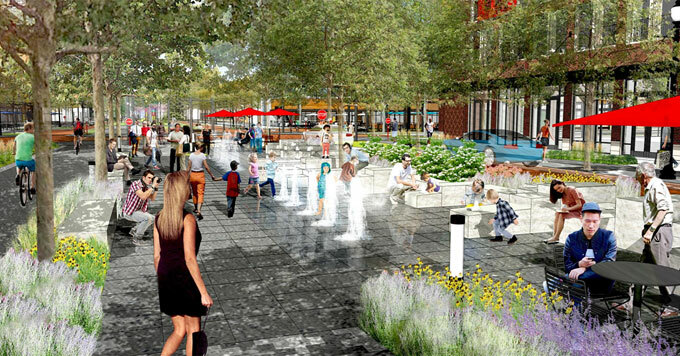 He focused on creating a walkable downtown with green space, wide sidewalks, and bike paths. Now, residents of Carmel can walk to stores, restaurants – and even a concert hall. When people drive less, there’s less carbon pollution. So Brainard says a pedestrian-friendly city is not only more enjoyable to live in – it’s good for the climate too.